9 days from £2085pp plus international flights. This promises to be an unforgettable week, combining 'big 5' game viewing, insightful walking safaris, driving through eSwatini and downtime on a superb beach in the renowned iSimangaliso Wetland Park. 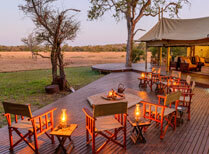 Your safari destination is none other than Kruger, arguably the most famous national park in Africa. You will have an opportunity for a game drive with a great chance of spotting elephants, rhino, lions, leopards, buffalo, giraffe, hippos and much more of Kruger's exceptional wildlife. Most of your time, however, will be spent on walking safaris. You will gain a new perspective on the natural world as you follow your guide through the bush, learning bushcraft skills, interpreting signs and tracks and picking up important survival skills. Next you'll pick up a hire car and head to the KZN coast via eSwatini. 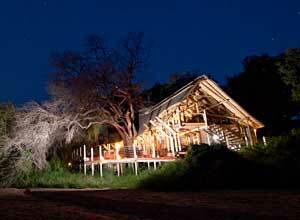 A night on a nature reserve in this kingdom acts as a gentle introduction to the more relaxing part of your trip. 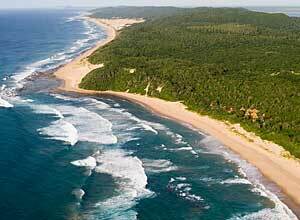 Once at the coast you can enjoy a magical mix of coastal forests, bush, lakes, grasslands and gloriously unspoilt beaches. You can spend days by, in and on the water, sunbathing, swimming and snorkelling and taking a ride in the lodge's launch out beyond the breakers in search of dolphins and whales. On land you can accompany a guide on nature walks, go bird watching or kayak on Lake Sibaya a short drive from the lodge. This all adds up to a hugely rewarding holiday and you'll come away not just with many happy memories but also with some new-found skills and knowledge. Please note the minimum age for the walking safari is 12 years. On arrival at Johannesburg airport you will be met and assisted through customs and immigration. Once you have collected your luggage, it's on to the next 90 minute light aircraft flight to Skukuza, in Kruger National Park. 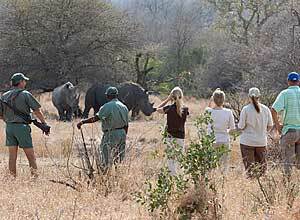 From here you will be taken by safari vehicle to Rhino Post Safari Lodge, about a 45 minute journey. The lodge is in a 12,000 hectare private concession within Kruger National Park, adjoining the Mala Mala and Sabi Sand reserves. The 8 spacious suites are on stilts with private verandas overlooking the dry riverbed. Enjoy a refreshing swim in the pool or a cold drink at the bar and relax after your long journey. Your African adventure is about to begin! Dinner. This morning you have an early game drive, a chance to spot the 'big 5', followed by brunch at the lodge. 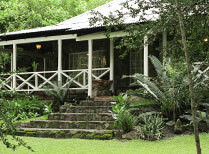 You then travel the short distance to Plains Camp, your base for the walking safari. 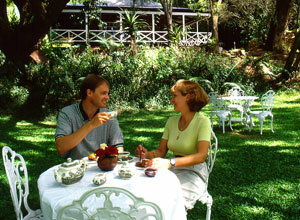 You spend the heat of the day relaxing and, in mid afternoon, enjoying high tea. Your first walk will be in the late afternoon. Led by 2 experienced guides, you will learn how to identify different trees, grasses, animals, insects & birds and be introduced to tracking and survival skills. This is a full-on experience, immersing you in nature and is sure to be highly informative & rewarding. Brunch, high tea, dinner. The day is dedicated to walking safaris. Walks take place twice a day, early in the morning and late in the afternoon, avoiding the hottest part of the day. Most walks last between 3 and 4 hours, but can be shortened or lengthened to suit your wishes and needs. There are many walking trails leading from the camp and your guides will lead you on a fascinating day of discovery. After the first walk you head back to camp for brunch and a siesta. You will set off on your final walking safari in the late afternoon, with chances to demonstrate your newly acquired knowledge and skills. Brunch, high tea, dinner. 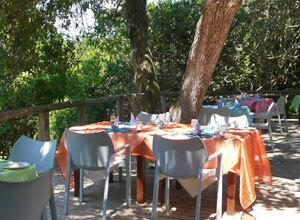 After breakfast you will leave Kruger National Park. At Skukuza airport you will pick up your hire car and begin the next part of your adventure as you head for Mlilwane Wildlife Sanctuary in eSwatini. The journey will take between 4 and 5 hours and will take you through some stunning scenery. On arrival at your accommodation you will have time to unpack and freshen up and perhaps explore or relax in the grounds before dinner. Breakfast, dinner. This morning you can choose to have an early breakfast and get on the road, or a more leisurely one. Your aim is to reach Coastal Cashews (about 4 hours away) for an organised transfer to Thonga Beach Lodge which departs at either 12 noon or 3 pm, so the choice is yours. At Coastal Cashews your vehicle is left in a secure place and you join a 4 x 4 vehicle for the drive to Thonga Beach Lodge where you will spend the next 4 nights. 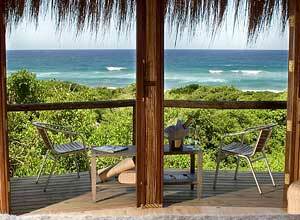 This is a lovely luxury lodge on a beautiful beach within the iSimangaliso Wetland Park. It is time to relax, enjoy the ocean views and sample some exquisite seafood. Breakfast, dinner. If you can tear yourself away from the beach, there is plenty to do. The clear ocean waters with their shallow reefs and shoals of brightly coloured fish are ideal for snorkelling and diving. You can also go out in the lodge's launch beyond the breaking waves, looking for dolphins, whales and whale sharks. Out here you can swim in their company (this excursion is payable locally). 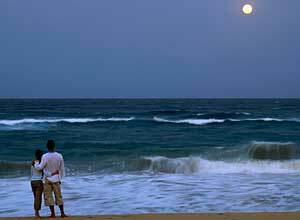 In summer (Nov-Feb) you can take nocturnal walks or drives searching for egg laying turtles. Breakfast, lunch, dinner. Another day in paradise. You can opt for a lazy day around the lodge, treating yourself to a spa treatment and enjoying the fine food on offer, or head to the beach for swimming and snorkelling. 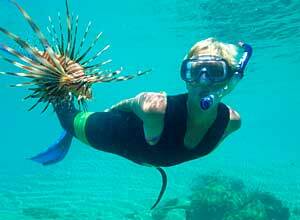 If you feel more adventurous you can take advantage of the various activities on offer. You might like to visit a Tsonga homestead and learn about their unique culture, spending time talking to community members and visiting a village school. However you choose to spend your day, why not conclude it with sundowners on the shores of Lake Sibaya, a large freshwater lake with abundant bird life. Breakfast, lunch, dinner. This is your last morning at the beach and after a relaxing breakfast the 4 x 4 will be ready to take you back to Coastal Cashews and your hire car at 10.30 am. The drive to Richard's Bay airport, where you will drop off the hire car is about 3 hours. Once you have handed back the car, you can catch your onward flights. Breakfast. Price notes: 2019 guide price pp sharing: 16 Jan - 30 Apr 2019 from £2580. 1 May - 30 Jun 2019 from £2085. 1 - 31 Jul 2019 from £2375. 1 - 31 Aug, 1 Oct 30 Nov 2019 from £2785. 1 - 30 Sep 2019 from £2435. 8 nights accommodation on twin share basis; meals as specified; soft drinks, local beer and house wine at Plains Camp; use of snorkelling equipment, kayaks on Lake Sibaya, guided walks and cultural tour at Thonga Beach Lodge. This holiday starts at OR Tambo International Airport in Johannesburg and ends in Richard's Bay. Return flights from the UK will cost from £1,100 per person, depending on season and flight availability. We will be happy to book your international flights. Departure dates: This is a tailor made holiday suggestion. It can be enjoyed at any time of year, so you may take this holiday at any time you like. 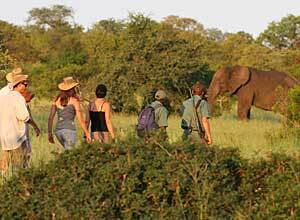 World famous Kruger National Park is a superb Big 5 game park, with varied habitats. There are also many private reserves adjacent to the national park, such as Sabi Sands and Timbavati. The Kingdom of eSwantini, formally Swaziland, is famous for its rich cultural heritage and some good game reserves.